Anonymous, HUMOR REPROACH CANDITION MAP OF EUROPA AND ASIA. Tokyo, May 28, 1904. Lithograph printed in color, 15”h x 21”w at neat line plus ample margins. A previously unrecorded Meiji 37 or 1904 anthropomorphic propaganda map celebrating Japan’s victory in the Russo Japanese War. This map was issued in May 28 of 1904, immediately following Japan’s successful bombardment and siege of Russian-held Port Arthur (Dalian). 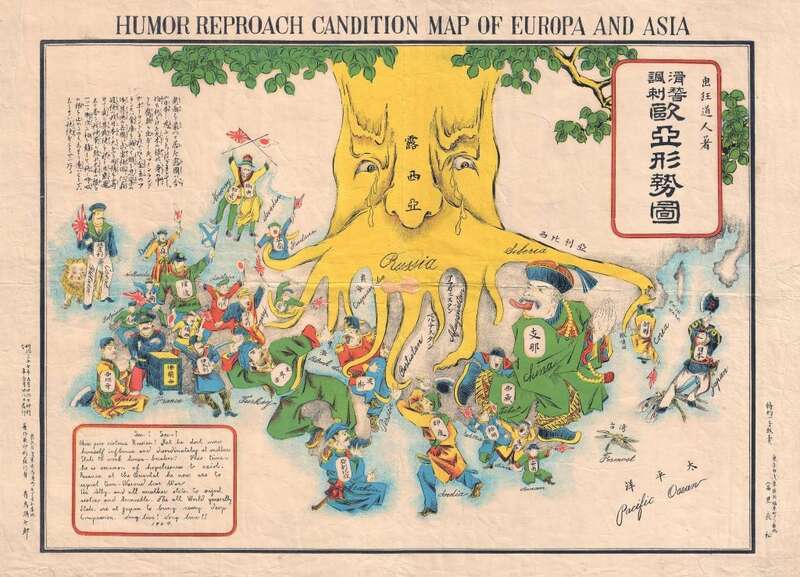 This is the second of four Japanese anthropomorphic maps associated with the Russo-Japanese war, predated only by Kisaburō Ohara’s April 1904 A Humorous Diplomatic Atlas of Europe and Asia. Unlike Ohara’s map, which was issued during the Siege of Port Arthur, this map postdates the siege by nearly a month. Here Russia is represented by a gigantic yellow tree, weeping copiously even as its tentacle-like roots extend into Europe and Asia. Japan, from its island stronghold, hacks at Russia’s roots with a broadaxe, doing serious damage in the vicinity of Port Arthur. Throughout Europe and Asia Japanese flags and Imperial Naval ensigns are being waved in celebration of the Japanese victory. The exceptions are Germany, which as a Russian ally is waving the Russian naval ensign, and Denmark, which waves a Swiss flag indicating its neutrality. To the East China claps its hands and childishly sticks out its tongue in the direction of Russia. While the large block of English text at lower left suggests the map was intended for both Western and Japanese audiences, it is so poorly written that we can safely assume the map never developed a following in Europe. Though this is obviously difficult to interpret, the artist may have wished to suggest that Russia, having been defeated by Japan, was suffering an existential crisis—a suggestion certainly born out by events of the Russian Revolution. More broadly, this was also the first time in modern history that a European power suffered a major defeat at the hands of an East Asian nation. In this context, the artist seems to be suggesting that the victory compelled European nations to acknowledge Japan’s position as a world power. 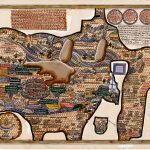 Anthropomorphic maps were common in Europe from at least the 1860s, but the genre was first exploited by the Japanese during their war with Russia, when they became popular tools for both internal propaganda and for communicating Japanese solidarity with European powers, specifically England. In all, four such maps were issued to illustrate the Russo Japanese War at different points. All except the first are rare, and indeed this Humor Reproach Candition Map is entirely unrecorded, at least in the West. 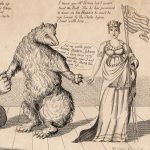 Not in OCLC or Persuasive Maps: The PJ Mode Collection. 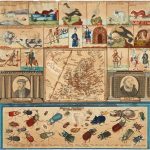 Offered in partnership with Geographicus Antique Maps. Folded in fourths at some point, with patch small loss at central intersection and minor wear along edges.